Fundrise investors earned an average annual return of 13%*. The first-ever eREITTM investment launched to a waitlist of +16,000. The Fundrise Income eREIT is a low-fee, diversified commercial real estate investment available online to anyone in the United States, regardless of their net worth¹. As of January 15th, the wait list to access the eREITTM investment had grown to over 34,000. 17 investments returned principal to investors. Our thesis of careful investment selection in expanding markets paid off as we successfully returned principal on 17 different investments and paid current interest on dozens of others. Our investor base more than doubled. We saw tremendous user growth driven by referrals from happy investors and glowing press from outlets like CNBC and Wired. 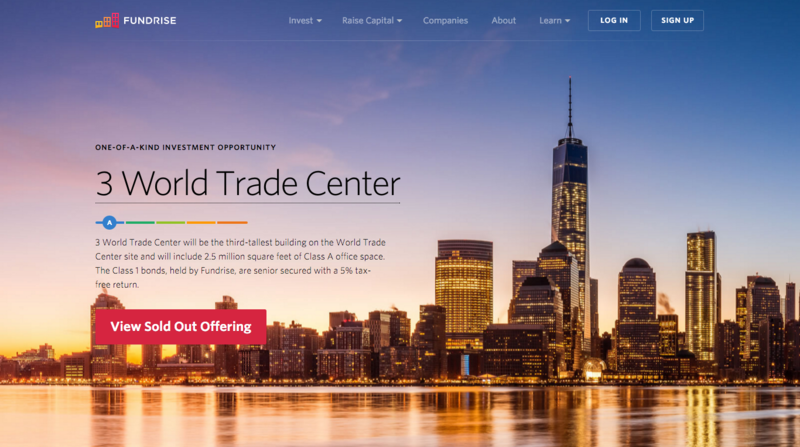 We made history by offering the chance to invest online in NYC’s 3 World Trade Center. In January 2015 we offered our investors the opportunity to access one of the country’s largest, most iconic investments - 3 World Trade Center in Manhattan. Fundrise expanded rapidly, making investments in 13 new markets. In 2015 we added investments in markets like Atlanta, Chicago, Denver, Los Angeles, Phoenix, Salt Lake City, and Seattle. We doubled our team to help ensure we source the best real estate. Having an agile, forward-thinking, low-ego team has been key to our success. In 2015 we added several new team members, the best and brightest from across real estate, finance, and technology, who’ve helped us continue our high-growth trajectory. And finally, we worked to improve investing for everyone! We worked hard everyday to reform the typically high-fee, unfair investment space, building a better model with real accountability and transparency. We are tremendously grateful to everyone who helped us to make 2015 an incredible year. 2016 is off to a great start and we look forward to helping our investors achieve their most prosperous year yet.